LOS ANGELES (Bloomberg) -- Toyota Motor Corp.'s new Lexus GX SUV was labeled a “safety risk” by a magazine, complicating efforts by the world's largest automaker to repair its image after record recalls. The 2010 GX 460 received the designation because of handling in emergency driving tests, Consumer Reports said today in a statement. The magazine, published by Yonkers, New York-based Consumers Union, said it hadn't deemed any vehicle a potential safety risk since 2001. Toyota's recalls of more than 8 million vehicles worldwide for defects linked to unintended acceleration and brakes have hurt its reputation and led to U.S. congressional hearings and a rebuke by Transportation Secretary Ray LaHood. The U.S. assessed a $16.4 million penalty against Toyota for delaying its recall of sticky accelerator pedals and said there may be more fines. “We're concerned with the results of Consumer Reports testing on the Lexus GX 460 and their suggested buyer recommendation,” Bill Kwong, a Lexus spokesman, said in an e-mail. While the model meets or exceeds U.S. safety rules, Toyota will try to duplicate the test results, Kwong said. The company “appreciates Consumer Reports bringing it to our attention,” he said. 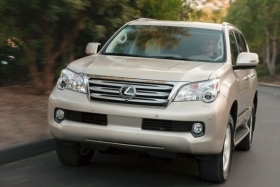 The GX has a starting price of about $52,000, according to Lexus's Web site. The Japan-based company has its U.S. sales headquarters in Torrance, California. Consumer Reports checked the initial findings in the “lift-off oversteer” test of the GX by repeating it on a second vehicle, said Douglas Love, a spokesman for the magazine. The publication said it shared the results with the U.S. National Highway Traffic Safety Administration. The magazine said it is unaware of reports of accidents resulting from what it found in the GX tests.